Show your love for the sport of running in a subtle and beautiful way with the engraved necklaces for runners from Gone For a Run. These lovely pendant necklaces can be custom engraved with text of your choosing to create a unique and thoughtful gift. In addition to personalized options, we also carry pendant necklaces that are engraved with race distances, inspirational sayings and race cities. 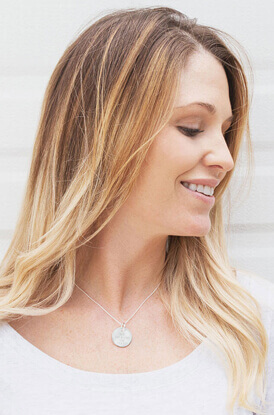 Each one of our engraved necklaces features a sterling silver pendant engraved with elegant text. Some also include double charms to add extra space for a personalized message. Each necklace also comes with your choice of chain to complete the set. We offer a large variety of different customizable pendants for runners. Choose the perfect shape and size for yourself or your gift recipient by browsing our selection. Our small round pendants offer a classic and understated look while our larger rectangular pendants make a bigger statement. We even offer engraved running necklaces that are reminiscent of dog tags, which would be a great option for any male runner in your life. Small square pendants are perfect for anyone who likes to stand out in a subtle way. We also carry heart shaped pendant necklaces that make wonderful gifts for runner girls. Choose a pendant with one of our pre-engraved inspirational sayings or opt for a personalized option. We also offer engraved necklaces that are meant to commemorate milestone races. Celebrate the completion of a big race in a big city with one of our race city necklaces. Our race distance necklaces are also a great way to show how proud you are of your favorite runner for finishing a long race. We offer pendants that mark 10-mile races, half marathons and full marathons. You can also choose from ultra-runner, triathlon and track and field runner's pendants.